The remains of this unknown trooper were found in 1926 prior to the 50th Anniversary of the Custer Battle. Presumed to have been one of Major Reno's men, one of the first Seventh Cavalry men killed in the opening phase of the battle in the river valley near Garryowen, Montana. Apparently high water in the spring following the famed battle, caused the soldier's body to be buried, and it was not found until the road crew building the US 87 Highway uncovered it 50 years later. 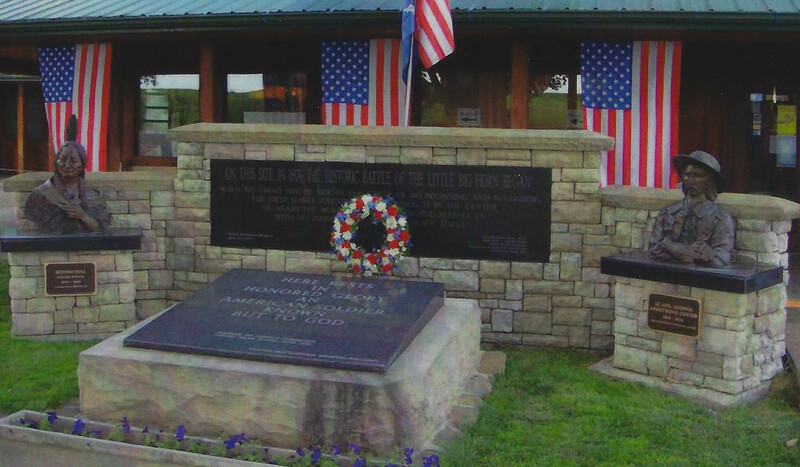 Now 125 years after the Battle of the Little Big Horn the Custer Battlefield Museum unveiled a new 'Peace Monument' which is located behind the Tomb of the Unknown Soldier. Featured on each side of the Granite Peace Monument is a bronze sculpture of Sitting Bull and General George Armstrong Custer. From I-90 use Exit 514 into Garryowen.From I-90 use Exit 514 into Garryowen.